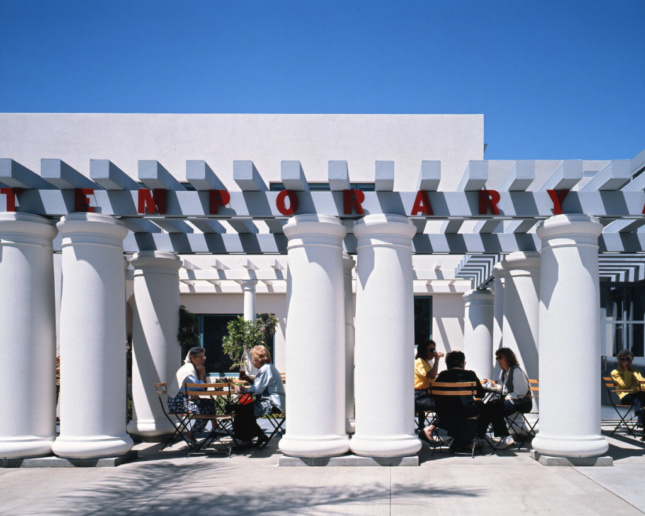 As a controversial plan to expand the Museum of Contemporary Art (MCA) San Diego campus by Selldorf Architects forges ahead, Denise Scott Brown and other notable figures have come out in defense of a 1995 Venturi Scott Brown Associates-designed (VSBA) postmodern addition to the complex that is in danger of being altered. 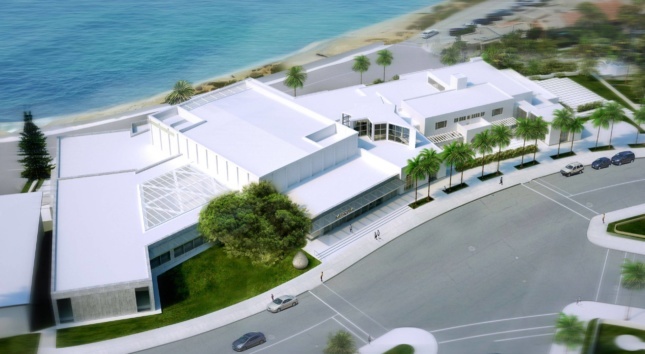 Selldorf Architects unveiled their $55 million expansion plans for the 75-year-old museum in La Jolla, California, in 2015, promising to double its overall size to 104,000 square feet while also quadrupling the museum’s galleries to include a total of 40,000 square feet of exhibition space. Originally opened in 1941 in a private residence designed by noted California architect Irving Gill in 1915 for journalist and philanthropist Ellen Browning Scripps—founder of the nearby Scripps Research Institute and of Scripps College in Claremont, California—the MCA complex has been heavily altered and adapted over the years. Major renovations by San Diego architects Mosher Drew added formal galleries to the home in 1950 and an auditorium in 1960. A subsequent renovation by the firm in 1980 added the first climate control system for a west coast museum. VSBA’s additions came roughly 15 years later and included adding a new entry sequence while also expanding the museum’s footprint by adding 5,000 square feet of new galleries and a cafe, restaurant, and gift shop. 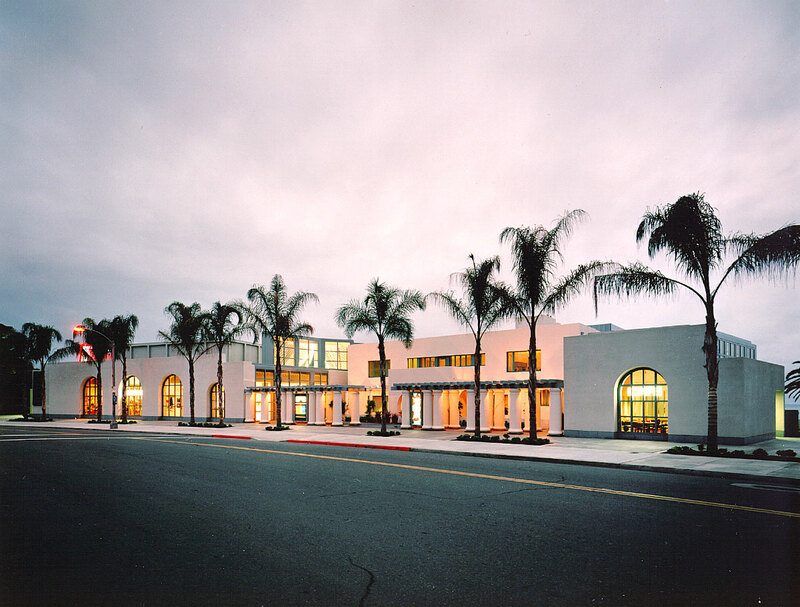 According to Scott Brown, the 1995 addition, executed in association with architect David Singer, was designed to align the growing museum with the town of La Jolla by creating a series of artful gathering spaces where the museum could hold public events without exposing valuable artworks to wear and tear. The iconic space, known as the Axline Court after a donor who contributed to the project, is made up of a previously-existing courtyard VSBA closed-in. Starburst shaped, supported by scattershot piers, and topped with clerestory windows and sculptural, neon-lit arches, the hall has acted a grand entry vestibule for the complex for over 20 years and is an iconic postmodern space if there ever was one. The $6.18 million project aimed to “enrich the museum’s image and civic presence,” according to the firm’s website, a feat that was accomplished by uncovering and recreating certain historical elements while also adding new, dramatic spaces imbued with a late 1990s sensibility: cool beige and blue terrazzo floors to compliment the sea, oversized archways echoing neighboring buildings, and of course, copious neon signage. Venturi and Scott Brown also worked to expose and restore several elements of the original Irving Gill-designed façade along the town-facing side of the complex, including portions that had been demolished or covered up by the earlier Mosher Drew interventions. In spectacular PoMo fashion, the designs included a pair of super-sized, vine-covered pergolas recreated out of fiberglass and steel in homage to Gill’s original designs. 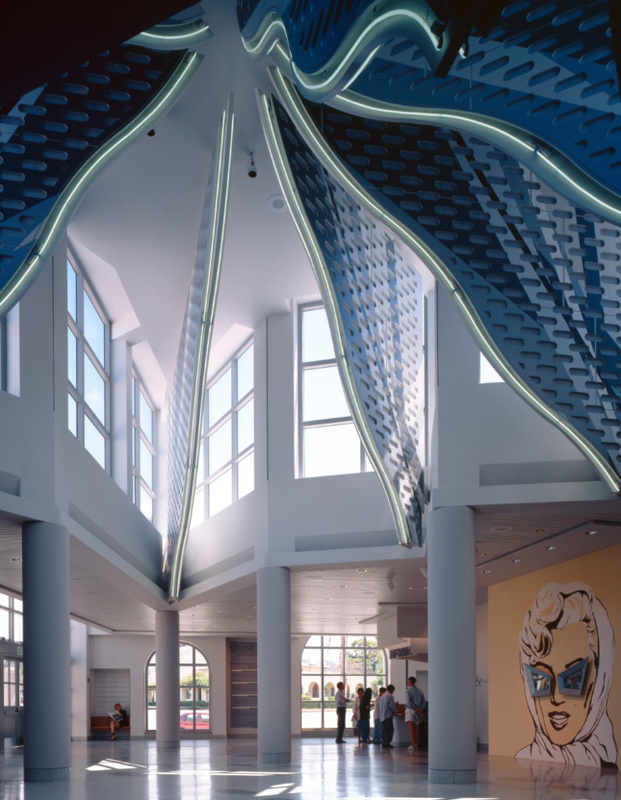 The pergolas, bookended by the cafe and Axline court, created a new, multi-faceted entry for the complex articulated as a breezy, covered walkway. The initial Gill-designed building was itself originally fronted by a set of pergolas—crafted out of wood—as are several other buildings in the area also designed by Gill, including the nearby Women’s Club building, now home to the La Jolla Historical Society. To the south of the pergolas, the VSBA-designed facade wraps the main entry containing the Axline Court as well as the auditorium from 1960. The volumes are sheathed in stucco walls punctuated by a series of arch-topped windows. The arched windows are another nod to the Gill-designed buildings nearby. Along its backside, the VSBA additions spill out over a sandy cliff overlooking the ocean. Designed after the 1990 passage of the Americans with Disabilities Act, the VSBA addition brought accessibility to the complex, as well, adding a series of sloped concrete ramps along this exposure that are terraced into the hillside as a meandering trail. Selldorf’s addition to the complex would reconfigure and hollow-out the auditorium along the front of the building into a new main entry, gift shop, and large double-height gallery. The building would be extended southward from there in a collection of smaller new gallery spaces organized into a pair of bars the form a wedged shape in plan. Another oceanside terrace would be added at the back of the new wing, as well. Annabelle Selldorf, principal of the New York City-based Selldorf Architects, explained that the expansion is vitally necessary for the museum because the 1995 addition “devoted little new space to exhibiting art,” due in part to a change in scope for the project partway through design. The museum in its current configuration simply doesn’t have enough space according to Kathryn Kanjo, MCA executive director and has “remained constrained” over the years despite the 1995 addition. Kanjo explained in a call that she and the museum board are interested in being able to display MCA’s permanent collection while also showcasing traveling exhibitions. Under the current configuration, the museum has to choose between those options, an untenable position for an institution striving to serve a broad and diverse public, Kanjo said. With the additions, the director hopes to reshape the complex “strategically” and “sensitively” in a way that adds “coherence to complexity” but also remains respectful to the existing portions of the building. “Annabelle [Selldorf] appealed to us as an architect for this reason,” Kanjo said. Selldorf echoed the sentiment, explaining that her office sought to “have a dialogue with the existing buildings and to to examine how they can evolve” while creating an addition that allows visitors to “understand they’re moving through different eras of the building,” with activity to be funneled through the new portions. Selldorf added that although the Axline Court “won’t be the entrance anymore, it will have a more distinct function and will feel a bit like the center of gravity” for the complex. Supporters of the VSBA project recently sent Kanjo and the MCA board a petition calling the proposed additions a “tremendous mistake” that damage “a cultural landmark” while also “severely weakening La Jolla’s beloved village center.” The petition is signed by 70 architectural thinkers, academics, and practitioners, including the deans of Harvard and Penn and several chief architecture curators at the Museum of Modern Art, the Getty Research Institute, and the MAXXI Museum. Scholars Stanislaus von Moos, Esther da Costa Meyer, and Jean-Louis Cohen, critics Charles Jencks, Martin Filler, and Paul Goldberger, and architects Toshiko Mori, Robert A.M. Stern, and Sir Terry Farrell signed on the petition as well. VSB’s design, unlike that of the proposed expansion, arises from careful study and understanding of La Jolla’s urban form. Its street frontage, museum store, and cafe extend the rhythm of Prospect Street’s lively storefronts, celebrating the museum’s location in the village commercial center and drawing visitors toward the building. At the entrance, visitors then encounter an urbane courtyard that fronts the museum’s Irving Gill-designed Scripps House: it invites them to rest for a moment, enjoy Gill’s architecture, have a coffee, and then enter the museum. This well-loved urban space is now threatened by the museum’s expansion plan. The plan, drawn up by New York-based Selldorf Architects, would tear down much of VSB’s facade as well as their dramatic colonnade—interrupting the urbane rhythm of the street and destroying the courtyard. And it would move the museum’s entry to a formulaic glass lobby that thumbs its nose at Gill’s architecture. Demolishing the colonnade is billed as a way of making the house more visible—but actually, it would prevent visitors from experiencing it in the way Gill intended: from the intimate, pedestrian-scaled space in front of it. And it would destroy the sense of enclosure that VSB created for the adjacent town green formed by a group of surrounding Gill-designed buildings. The new plan is a slap in the face to Gill: to the composition of the group as a whole and in particular to the Scripps House, which without the colonnade would be left looking small and insubstantial, overshadowed by the museum’s later additions. 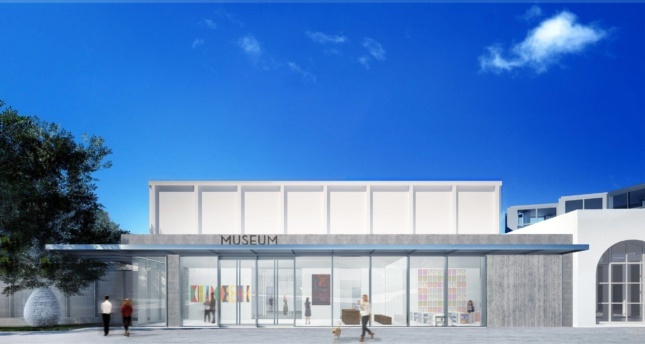 The petition implores the museum to “come up with a plan for expansion that is sensitive and respectful to the village of La Jolla” as well as the VSBA designs and references the recent landmarking of VSBA’s Sainsbury Wing at the National Gallery in London as an appropriate way of acknowledging VSBA’s work in San Diego. For now, MCA’s plans are moving full-steam ahead. The museum has been closed since last year and groundbreaking is scheduled for this fall. The project is fully-entitled and construction documents are currently in development. Worse yet to Scott Brown’s efforts, removal of existing sections has already begun. One of the VSBA-designed pergolas was removed a few weeks ago and was transferred to a new privately-held parklet being planned by the La Jolla Historical Society.